I consider coconut milk a magic wand – it brightens up the flavor of everything cooked in it. The astringent young langka with its milky sap turn into savory dish with cream on creamed coconut milk. I would soak the soriso or dried fish first in warm water to make them malleable and get rid of some of the salt before adding them to the dish and add some chopped chili to contrast the creaminess of the dish. This is off the topic, MM…I would just like to thank you from the bottom of my heart for this blog…Through this blog, I have met THOUGH ONLY HERE IN CYBERSPACE 5 very WONDERFULPEOPLE ….2 in California (one who is my KITCHEN FAIRY GODMOM and then there`s my Vietnamese food buddy..Ted..), 1 back home (who in my past life we were probably twins!…have sooo many similarities )…1 here in Vancouver (Onie) and of course MM!…You guys brighten my day!!! THANK YOU!!!!!! 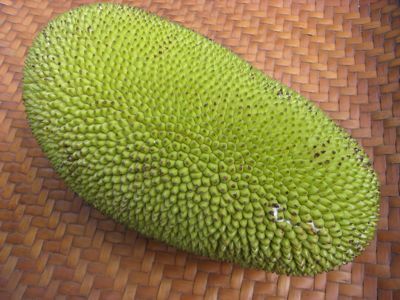 Kamansi (seeded breadfruit) can also be cooked the same way. Dried pusit chopped thinly is also good with the ginataang langka or kamansi. Would this be good with some cut up chili? I love, love the combination of coconut milk and chilies! MM, you might want to try the Leyte version of langka salad. It is yummy and visually appealing. Here’s the procedure: Peel the green jackfruit and boil it until tender. Remove any hard part. Set aside. Chop finely ginger, red chili, round onion and green onion. To the grated coconut, add Â¼ cup water and extract coconut milk. Simmer coconut milk in skillet for 5 minutes or so, stirring constantly to prevent curdling (this will minimize the sweetish taste of coconut milk). Season coconut milk with salt and mix with cooked langka and chopped ingredients. Just a correction: adjust the amount of coconut milk to the quantity of cooked langka. Best to get a large coconut and add 1/2 to 1 cup water to squeeze the milk. this is really delicious. love it with sago or those round rice(?) thingies..
You’re talking about the ripe langka mixed into the ginatan, a desert concoction. This is unripened lanka made into ginataan not equal to ginatan. I also love cooked langka! The only messy part for me is chopping the langka into bits. Unripe langka sap is sticky and goo-ey. I found out that rubbing everything (from hands, knives and chopping board) with cooking oil helps clean everything easier. Just with the idea of coming out with this delicious dish makes me go through all the tedious process of getting the langka nicely prepared. And when I do not have the soriso I make use of tinapa. It is not so salty and its “smokiness” gives it a milder fish taste. Shrimp bagoong can also do in a pinch if soriso (we use daing na labahita) is not available. Sili (labuyo or siling haba) gives it the added kick. Sarap!!!! Oh yum. I am very excited. Several helpers have tried to make this forme but never to my liking, probably because I never had a proper recipe for them to work with. Thanks for this one! I am easily one of your readers that has tried 10+ recipes from this blog! Oh, this brings so much childhood memories. This is so good with buwad/dried fish or grilled tinabal (sorry, i don’t know if there’s a direct translation for it). Yum! I know that coconut milk is very high in fat, but are you saying it is high in cholesterol as well? I’ve been asking and googling around for years, and as far as I know, cholesterol is found only in animal-based fat (incuding milk, eggs, butter)..please correct me if I am wrong. Great blog, MM, as always…thank you for sharing your wonderful talent with us, and for letting us into your kitchen. MM, my mom cooks her ginataang langka a bit on the dry side, with lots of chopped shrimp and sili. As you’re wont to say: but fantastic! @ted..thanks for the info. now i realize what this dish is and remember that it’s good too. i love anything with coco in it. whew! my favorite.. yum! just had it this weekend.. my mom makes something where the gata is not cooked.. it’s really good.. This is probably the one of my favorite dishes! I first tasted when our long-time maid, Noemie, made it for us. I loooove this dish! I sometimes add a few lime leaves on ginataang jackfruit and cut red and green chillies for colour. Lime leaves tend to be overpowering, so I just add about 2-3 whole leaves for a bit of added taste and novelty. We add bulad bolinao(dried bolinaw fish, instead of pork or soriso, sometimes any meaty dried fish)and lotsa ginger…lucky for us we can easily buy clean,sliced jackfruit at the mall grocery here,saves us time. Love to eat it with fried fish or tuyo…and lots of rice. i experimented with this adding a bit of curry powder and sliced liempo, tasted great! Hi, ginataang langka is one of my favorite langka dishes! Instead of tinapa, my Dad cooks it with spicy sardines in tomato sauce to give a peachy-pinkish color. It looks and tastes a lot better too! 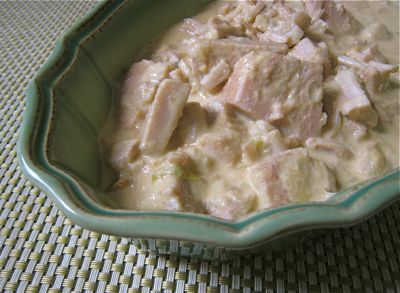 Hello M.M and the Pilipino food Lovers,Yes i was searching for this Langka or Otan Nangka (Visayan version),thanks for posting this recipe,its one of my favorite. My memories of delicious food drives me to seach specially native visayan food. Heres our Otan Nangka recipe its the same procedure with yours MM,but when we boil the young nangka with the second extracted grated coconut we put a bunch of tanglad,(lemon grass) it will add a good flavor of the Otan,and instead of chorizo or dried fish,we put the big barbeque( sinugbang isda) on top of the otan as it simmers and add the last fresh fist extract coconut milk the last and sprinkle the chopped mint and cover,wow the aroma of the food soo good and when you eat those,soo delicous,you gonna sleep after eating those with rice,have a siesta after for 30 minute with open belly at the porch,those were the day’s in my hometown. To all Langka lovers,you can find the langka young ones in the Can at Asian groceries,just take off the hard part of the vegetable that are already in chuncks,we found this in Chines stores in Canada and boy as we see those cans we take it all,in case it run outs of stock we have some or distribute it to our friends here in Canada,you know Pilipina loves our food. 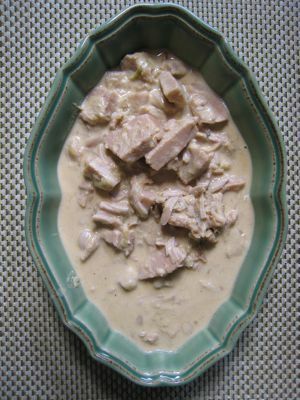 One way to cook this recipe without hassle is to put to all in the slow cooker except the fish. Slow cooker Otan Nangka(Langka veggie stew). Put in low heat when you are ready to go to sleep. Re-on those during your entended time to use for luch or dinner. Put the grilled big fish on top or enough that the stem can reach the fish for flavoring the veggies,salt to taste or patis and the cream of coconut the first extract ones,simmer on high for ten minutes and add the chopped mint and walla….. you just have the Etnic menu visayan version,don’t remove those you bring the slow cooker right to the table,just put a serving spoon and let them help themself,saves you from washing more pots. I serve this on our get together Pot luck party,this will dissapear in a minute or 2. Before i forget when redoing those langka otan put 1 grated onions and grated ginger,sorry i miss those.Enjoy cooking Otan nangka.